... and a new challenge. A yummy afternoon tea of scones straight out of the oven, a cuppa and my puta! 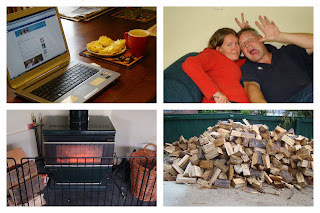 Our fire on - yes it got that chilly this morning we decided to put it on. And on cue a load of firewood arrived - will stack when the rain stops. 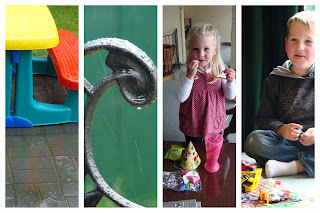 A couple of arty shots of the rain, Emma eating goodies after she arrives home from a friends 4th birthday party, and Finn with his cars. Hope you all have been having a creative day on this wet weekend. Just a short post tonight as have to go get ready for my cousins hen's night! Very cool arty shots there Mich! Love the photo of the two crazy people...lol. Have fun at the hen's night. GReat photos! So strange to see my blog on someone elses computer! and weird to see a fire going when we're so hot up here... hope you are all snug! cool pics.... love the idea of combining some pics for the day and printing them out in a collage format!! !